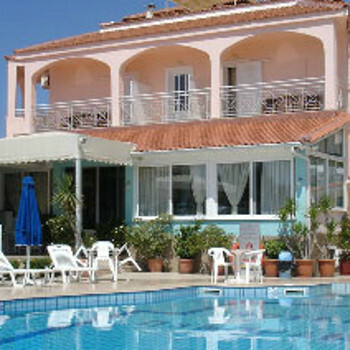 The Panorama is another hotel in the developing village of St. Vlas. Stylish and luxuriously furnished, the hotel offers a comfortable retreat from the hustle of everyday life and easy access to the long sandy beach. There are some lovely restaurants. Booked this hotel independantly after it was recommended to me by friends who had been there in 2004 and again this year. We stayed at this small family run hotel from 11th to 25th September 2007 on a half board basis. This is the 1st time I have booked a holiday independantly and I certainly was not disappointed. At the time of booking tranfers from Bourgas Airport to the Hotel were arranged with the owner, which meant that on arrival a member of staff was waiting to take us directly to the hotel. HOTEL CLEANLINESS. This hotel is without doubt the cleanest hotel we have ever stayed in. The hotel and rooms are cleaned daily and is certainly a credit to the owner and staff. HOTEL FOOD.We thought that the food was excellent, reasonable selection with both British and Bulgarian food available. Personally I thought that the chicken soup was superb thanks chef. If you require special food just ask. HOTEL LOCATION. Being only 60m from the beach and a few hundred yards from the local village it is situated in an ideal location. In the village there as a few local resaurants / bars that served both Bulgarian and British style food. If the weather is inclement there is not much to do around the village, but in the resort of Sunny Beach, which I beleive is Europe's longest resort,(10min in bus, only 1 Lev), there is plenty to do. HOTEL STAFF. Outstanding service from all the staff which all helped to make our stay there more memorable. ENTERTANMENT. As we were there the last two weeks of the season there was no entertainment as such but there was large screen TV in bar thich showed sporting events. There are a number of bars and complexes within walking distnce that regularly have live entertainment. We would certainly visit this hotel again and are more than happy to recommend it to others. If you want a relaxing chill out 1 or 2 weeks this is for you. More details at there web site. http://www.bourgas.org/hotelpanorama/ or contact the owner directly (e-mail on website). We were one of the first guests at the hotel and the staff were extremely friendly. We arrived at 1.00am and they were waiting outside the door to take our cases. Even when we were leaving at 3.00am they were helping us to the bus. With it being a small hotel they cleaned rooms and hotel everyday, it is a family run hotel. Food was excellent though not a great deal of choice. The location was good with rooms having a mainly sea view.